Sixteen Idaho-based firms collaborated in 2015 to create this Idaho-made firearm. Outdoor recreation — from camping to climbing, hunting to hang-gliding — each year generates $646 billion in consumer spending and 6.1 million direct jobs in the United States. In Idaho, according to the Outdoor Industry Association’s most recent survey, outdoor recreation annually is responsible for $6.3 billion in consumer spending; 77,000 jobs; $1.8 billion in wages and salaries; and $461 million in state and local tax revenue. Even before all the visitors come, at least 74 percent of residents participate in outdoor recreation each year. It’s no wonder, given that the state has the largest contiguous wilderness in the lower 48 states, including such destinations as Coeur d’Alene National Forest, Sawtooth Wilderness Area and the Salmon-Challis National Forest, where launching your kayak from Corn Creek to float the main Salmon River is a popular pastime. There’s a reason that the Idaho Outfitters and Guides Association has more than 250 member organizations. Those people and their customers need gear. And like any sector, the closer a company is to its customers, the better. Thus has been born a recreational technology (rec tech) sector with economic impact that goes well beyond the state. 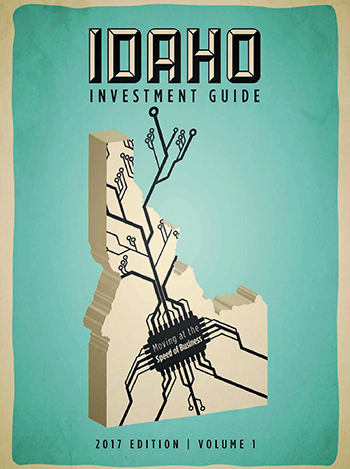 Recognizing that market power, the Idaho Department of Commerce has responded with the support those companies need, including the Idaho Recreation Technology Passport Program, established in 2014 and funded with state and federal money, to help Idaho companies travel to trade fairs and conferences to expand sales and product awareness. Here are a few glimpses of the industry’s many facets, and how they’re helping Idahoans and non-Idahoans alike appreciate the many facets of the state’s great outdoors. Big game hunters know Idaho, and vice versa. So it only figures that the providers of hunting necessities know Idaho too. The state has seen 50-percent growth in firearms and ammunition manufacturing over the past decade. Idaho is home to the nation’s largest producer of .22 and .223 caliber ammunition, one of more than two dozen Idaho manufacturers of custom arms, ammo and aftermarket parts. Among the reasons are some of the least restrictive gun laws in the nation, and some of the most protective laws of the niche itself. In 2015, with support from the Idaho Department of Commerce and Tactical Export Strategies, 16 of those two dozen firms — including Kryptek Outdoor Group in Eagle, Am-Tac Precision in Garden City and Nightforce Optics in Orofino — got together to create a complete and functioning firearm from Idaho-made products for the 2015 Shooting Hunting and Outdoor Trade (S.H.O.T) Show in Las Vegas. Later in the year, the firearm was auctioned off for $23,000 at the annual Governor’s Cup awards, and that price was matched by CenturyLink for a total of $46,000 donated to a scholarship fund for Idaho students pursuing post-secondary education in the state. Orofino, located along the Clearwater River in the heart of steelhead salmon country, is also in the heart of a very particular niche: the manufacture of jet boats, known for their ability to skim through shallow water and rapids with equal aplomb. SJX Jet Boats in Orofino says when it comes to shallow-water boating, “the SJX is a razor blade among butter knives.” SJX is one of 10 jet boat manufacturers in the Lewis-Clark Valley where the Clearwater and Snake Rivers converge. Others include Bentz Boats and Riddle Marine in Lewiston; and Hells Canyon Marine, Thunder Jet and Renaissance Marine Group in Clarkston. The boats aren’t known just for hunting, fishing and “brutal acceleration.” They also have helped rescue crews save lives, from the Pacific Northwest to the Philippines. Waterworks-Lamson came out of C1 Design Group, which got its start making high-caliber pedals and suspensions for the world’s top bicycle manufacturers. Starting with the patented Ketchum Release — a play on words on the company’s hometown of Ketchum, Idaho, for a product allowing easier release of a hooked fish — the company has designed some of the best fly-fishing reels in the world. Since acquiring Lamson from well-known rod and reel firm Sage Manufacturing, Waterworks-Lamson has continued to set the standard, and to do so from bases in Ketchum and Boise.